The Idling Calculator. How much can you save? When a utility vehicle is operating a lift, like the one on a bucket truck, it remains idling to power that equipment. 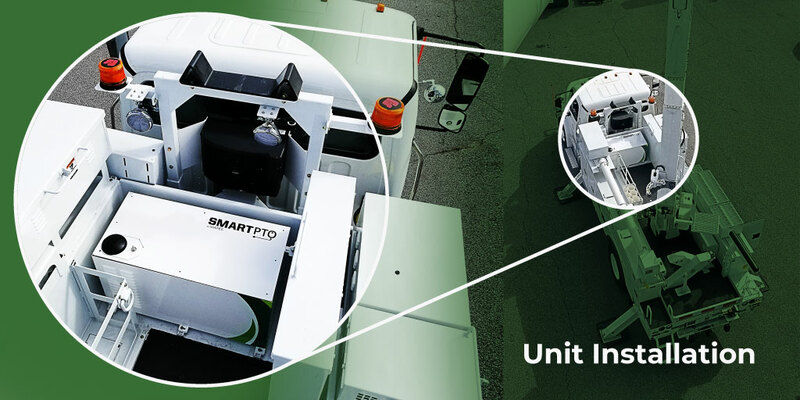 SmartPTO is the first modular electric power takeoff unit of it’s kind that eliminates idling on utility trucks. For a vehicle like a bucket truck, the impact of hours and hours of idling can be more than we might think, and when the stress of idling every day is relived, the results are undeniable. We have projected average savings of around $9,100 in just a single year of operation with SmartPTO on a bucket truck. Savings not only include the cost of approximately 1,890 gallons of fuel per year spent idling, but also the maintenance cost incurred by extra use of the engine on a daily basis. We have projected averages of 69% of the total yearly costs from idling alone. 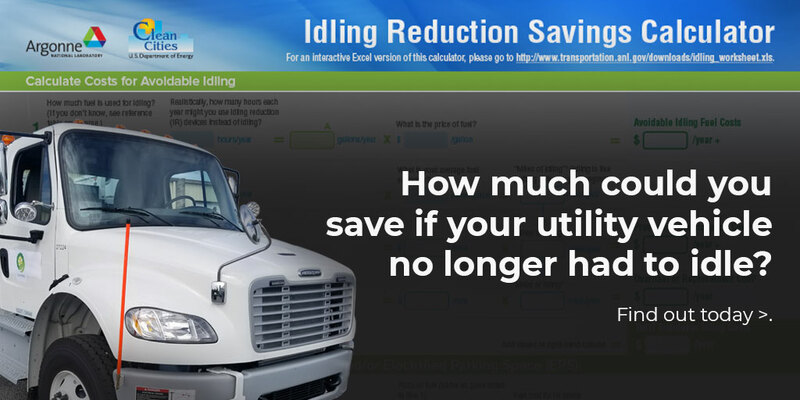 Argonne created an Idling savings Calculator so users can plug in their statistics and see just how much eliminating idling can do for them. 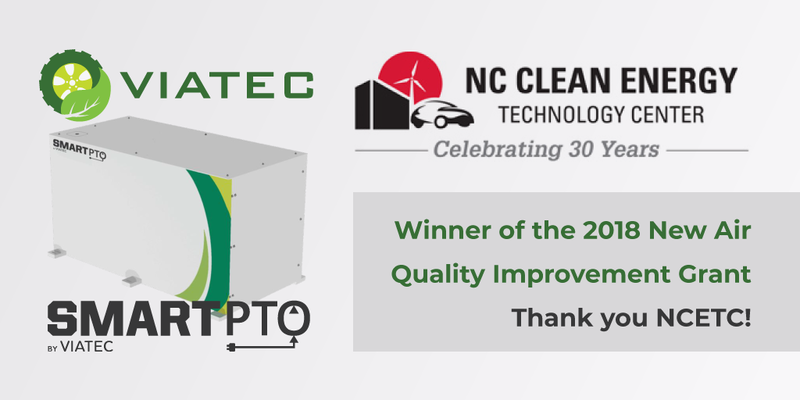 Early October of 2018, We were fortunate enough to be awarded the Clean Fuel Advanced Technology (CFAT) Project by the NC Clean Energy Technology Center (NCCETC). You can learn more on our write up. Town of Apex Awarded CFAT project winner and Takes Action! 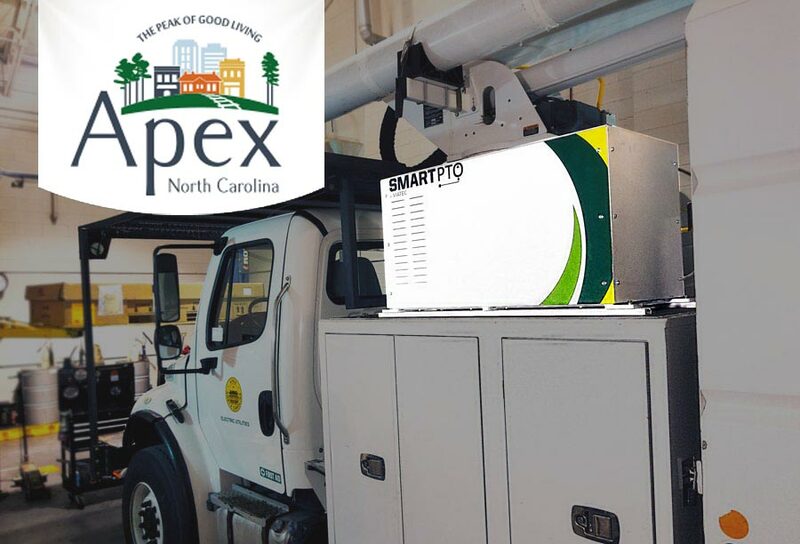 Now the Town of Apex in North Carolina has also been awarded by the NCCETC for it’s use of electric PTO’s and is making leaps toward the future by being the first of smaller municipalities to retrofit three of their bucket trucks with SmartPTO! All made possible by their recognition in the CFAT project. They will save around 5,670 Gallons of fuel. Remove an average of 72,900 lbs of carbon dioxide emissions from normal operation. In terms of environmental impact, this is the same as removing 10.5 cars from the road. Improve the safety of their operators. Extend vehicle life and lower overall the maintenance cost. Decrease the level of noise disturbance in their communities. We see the Town of Apex as a progressive leader for the green initiative in the state of North Carolina. They are the first of many towns and cities in the state and nationwide that we hope to see making steps toward the electrification of utility vehicles and equipment. Together we can stop the harmful effects of idling. 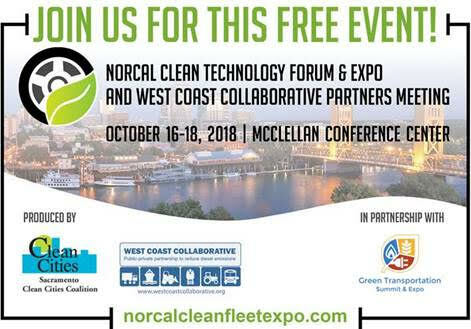 Earlier in October of 2018 NC Clean Energy Technology Center (NCCETC) announced the winners of their Air Quality Improvement Grant through the Clean Fuel Advanced Technology (CFAT) Project. 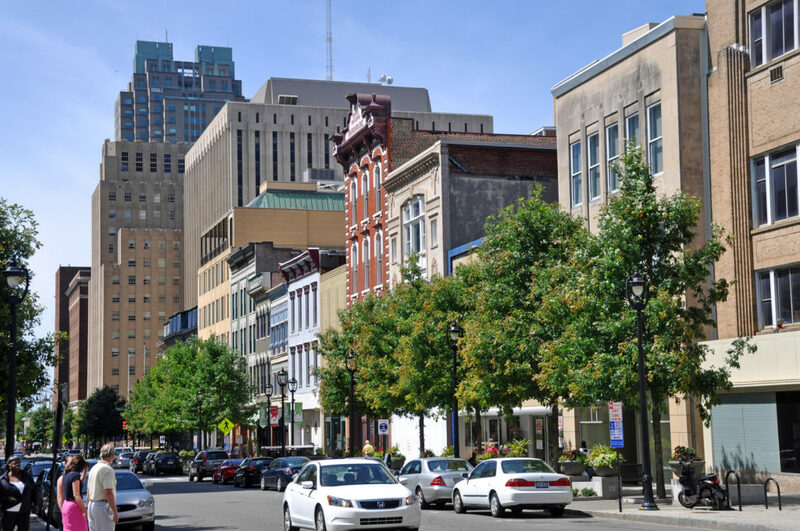 Initiated 2017-2018 for $5.6 million, the grant focuses on reducing transportation-related emissions and is supported with federal Congestion Mitigation Air Quality funding from the N.C. Department of Transportation (DOT). We are honored to be a part of that group! Over $1,100,101 is being awarded for ten projects including Viatec’s SmartPTO. Collectively these projects remove 62,949 gallons of diesel/gas a year, and 54,042 kg of daily emissions. We are honored to be awarded such a progressive grant, further solidifying our commitment to environmentally efficient technologies and products in the future. Here at Viatec, we are happy to announce the launch of our brand new flagship product, SmartPTO and more importantly it’s first ever field run with one of the largest utility suppliers in the nation. SmartPTO is The worlds first ever fully electric, universal, power takeoff unit that eliminates the need for idling by utility trucks. After it’s testing and approval for large aerial boom lift trucks with our new client, in the coming months we can expect to see eight units operating our truly affordable hybrid electric solutions. We encourage you to watch the video below to educate yourself on the environmental and financial effects of idling worldwide, and how SmartPTO is the worlds first viable solution. The integration and installation of our first road worthy unit was achieved late October. Considering the magnitude of Utility trucks on the road from this new client, we expect to see a swelling of SmartPTO equipped utility trucks in the near future. We have the utmost confidence in the viability of our product and it’s ability to drastically effect the real world. We hope to see a future without idling. A power take-off or P.T.O. is any of several methods for taking power from a vehicles running engine, and transmitting it to an auxiliary application, like the hydraulics for a bucket lift. These units most commonly transfer energy via the spinning drive shaft of the vehicle they serve, so in order to operate the bucket, a utility trucks engine will remain idle to supply power to the arm. This accounts for literally millions of hours of idling worldwide, every day. Take the bucket truck your local power company might use. This vehicle will idle for thousands of hours a year while operating the bucket lift attached to it. Without ever moving, the truck will idle long enough to account for 69% of its total maintenance cost, 1,890 gallons of fuel, and almost 38,000 pounds of carbon dioxide due to emissions. This is enough to drastically affect the life of the truck and its overall resale value. During operation it’s loud diesel engine will make communication nearly impossible. All due to the way a P.T.O. works. With such an obvious way to impact the cost of running modern fleets today, utility truck manufactures set out to create electric power takeoff units. 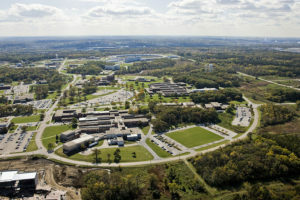 An E.P.T.O. would use batteries to supply power to the bucket arm to eliminate idling during operation. When a bucket truck was fitted, the units were installed directly into the drive train. Fully integrated, the trucks would rely on the operation of the E.P.T.O. If for some reason it failed, the truck would no longer operate. When the unit was removed the truck couldn’t be sold as it was. Replacing units was expensive and overhauling large fleets of preexisting trucks was inefficient. Trucks were better for the environment and quieter, but in turn more costly. The majority of utility trucks on the road remain idle while operating for this reason. What if there was an E.P.T.O. that was simple to install, cost effective, and unintrusive? Could we eliminate the huge toll idling takes environmentally and financially? Noise during operation has dropped by 85% allowing operators to communicate. Daily emissions are now a fraction of their previous footprint. The question we should ask ourselves is simple. Why run without SmartPTO? Jill Sorensen, SCRA Director of Entrepreneurial Programs and Executive Director of SC Launch, Inc.
SCRA fosters the growth of South Carolina’s Innovation Economy by supporting entrepreneurs, enabling academic research and commercialization, and connecting industry to innovators. ePTOs have been around a while and have changed radically. It all started by breaking some eggs . . . . The situation was complicated . . . So how did it go? Generally not great. BUT, the crews did enjoy using those devices over an idling engine when they did work. This was the most important lesson of gen 1. About 5 years ago ePTO battery technology veered toward Lithium Iron Phosphate (LiFePO). It is stable but heavy and expensive. Still, this was the right choice back then and brought some stability. They are still deeply integrated and can’t reasonably be removed before resale. The result is a lower 10 residual value due to buyer fear of battery issues and other novel product concerns they won’t have to deal with if they get a regular one at market price. Removing the systems before resale can add 25% – 35% to the resale value due to the low engine hours and almost new mechanical PTO. Annual fuel and maintenance savings will be $4,500 to $9,500 (depending on the application and vehicle engine size, idle time, bucket movement, miles driven). Insane savings. By adding a Gen 3ePTO to a new bucket truck, customers can expect to . . . Safer than ever: Sure, a little creepy but only at first. AI support never stops paying attention and can multitask like no one’s business. Gen 4ePTOs will become part of the crew. They will actively protect operators by continuous visual and audio monitoring of the operator surroundings. Autonomously identify threats to the operator, alert them and initiate life saving movement. This is going to require some serious testing and a lot of cultural change. In time crews will find “Jimmy CrewBot” is helpful, personably, useful to them. Jimmy will never lose focus on its mission of protecting his crew. That is how he will become part of the team. Afterthought: Luke Skywalker had R2-D2 – it wasn’t weird. Epilogue: Gen 3ePTOs can be scaled up or down and reconfigured to optimize for several applications including tankers, pumpers and pretty much anything that idles a lot.